I am fascinated by how things used to be made and am convinced that we need to return to a less energy hungry way of life, so twenty years ago I built my first pole lathe from instructions I read in a book. I did not believe it would work but now after a lot of practice I make my living from it, making traditional turned pieces and teaching my craft to others. 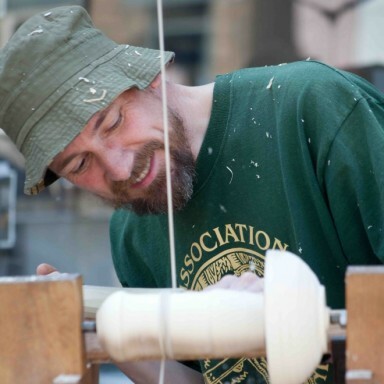 The pole lathe has a history going back over two thousand years and was originally designed to make bowls and cups for the people of northern Europe. The pieces I make would have been instantly recognised by Saxons and Vikings and of course can still be used today. Wood is a sustainable, clean, light, well-insulated and relatively unbreakable alternative to pottery.